Many users bemoan the lack of connectivity when discussing the iPad. True, I would love Apple to include native wireless networking similar to the Mac Finder that has access to all files on either iPad or Mac/PC. There are very useful options out there, however, that do the job very effectively. 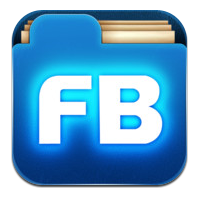 My favorite app for connecting to computers without iTunes or a cable is FileBrowser (available as a universal app for both iPhone/iPod Touch and iPad ). Many apps will open in …. Filebrowser, especially PDF and document apps ( annoyingly Apple’s iWork apps don’t – wish Apple would make their apps more open to sharing options; clearly the system allows it when all other apps do UPDATE – As of iOS 6, Apple’s iWork Apps ( Pages, Keynote and Numbers now work with FileBrowser as well as DropBox and Google Drive). This enables you to transfer a Word-compatible document or PDF file to your computer or workplace network. Any app that can save its content to the iPad’s photo library as a movie or image is accessible to Filebrowser network transferring as well. This is what I want to share with you today. Working in a school with iPads shared with all the grades, it is important that students and teachers can easily transfer their work from the iPad to the school network. It doesn’t take long for an iPad to fill up if photos, comic strips, movies, slideshows and the like from 28 different grades at left languishing on it. While you can connect the iPad to a computer via USB connector, it can be inconvenient and timeconsuming, particularly with iTunes file sharing as an option for documents. Sure, Dropbox can be used in many cases but not every grade or teacher is using Dropbox at school at present. So a good option for transfer is FileBrowser. While not as easy as drag and drop or using Save as…’ , the Filebrowser system is a simple matter of selecting, copying and pasting. I have had the opportunity to show some of my staff through morning training sessions but to assist in school wide adoption, I have made this video tutorial using the Explain Everything App and posted it on YouTube. While it is aimed at my staff, the steps outlined are relevant to any setup you may have. It is predominantly about transferring photos but the same steps are required for saving any document. I hope you find it useful if you are considering this as an option. If you have found other options for network connectivity with the iPad, I would love to find out about alternatives. Filebrowser is not free ($5.49AU at present, but has been as low as $2.99) so will set back a school a bit of money when deployed to a lot of iPads. For me, though, it is worth the money, certainly for individual iPad users who want access to their computers.